Opening in 1976, Gifts Afloat has grown into a specialty store in which a vast array of nautical gifts, decor, and clothing are featured. Major markets throughout the United States are visited regularly to provide the finest quality, most fashionable and unique assortment of nautical merchandise. Gifts Afloat invites you to enjoy a small sampling of our merchandise displayed on the following pages. We also invite you to visit our store. 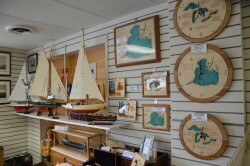 Gifts Afloat is located in St. Clair Shores, Michigan, north of Detroit and along Lake St. Clair between Lake Huron and Lake Erie. Gifts Afloat is readily accessible by boat—mooring at nearby marinas located on the famous Nautical Mile or traveling by car using I-696 and I-94. Once you step inside of Gifts Afloat you will return many times to discover the new arrivals. We look forward to serving you now and in the future.